Lose yourself in this satisfying tale of honor, chance, and star-crossed love, infused with Southern wit, grace, and charm, from the New York Times bestselling author of The Christmas Pearl and The Land of Mango Sunsets. One of the South's original blueblood families, the Langleys have more money than Morgan Stanley, and if asked, their matriarch, Louisa will tell you, more class. Which is why, when Elizabeth "Betts" Barrett falls in love and plans to marry J. D. Langley, Louisa is none too pleased. Only trouble can come from such a match, and it does. On the happiest night of Betts life  the night she and J.D. became engaged  Betts's mother is killed in a car accident after an ugly scene at the Langley mansion. In the trail of tears that followed, fingers are pointed, voices are raised, cruel words are hurled, the engagement is ended, and a young woman leaves behind a life she held dear. To Betts, the events of that dark night were a lifetime ago. Breaking contact with J.D. and her family, she hasn't let herself look back for the past 20 years. Strong and determined she's carved a successful and highly lucrative life for herself in New York's high-powered financial world. But now Betts's carefully carved present and her chaotic past are about to collide. 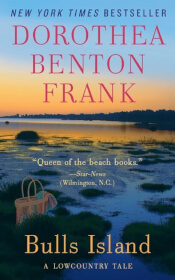 . . Hand-picked for a job she cannot refuse, Betts must return to Charleston to oversee the development of a wild coastal island, a project that will take her straight into the path of everyone she left behind, especially J. D.
Coming home, though, will be far different from what Betts expects. Everything she holds dear is at stake. Betts has a secret and everything she holds dear is at stake. When she's finally reunited with all she once loved, more is at stake than meets the eye. At the beginning of the book, Betts talks about trouble, that it "would get me anyway." Do you agree with her? Is trouble inflicted upon her, or does she create it for herself as well? How is this demonstrated in the story? The author named the main character Betts, "because she never backed away from a dare." Does the character fit her name? Do you agree with their McGee family's anger at J.D. after Adrianna's death? How have secrets shaped lives of Betts, J.D., Adrian, Betts's sister, Joanie, and Louisa? One of the main themes is the notion of going home  the return of the prodigal child. Can we ever truly go back home? How do experiences outside of the home shape how we look at the place we grew up? According to Betts, everyone looks at the world from their own point of view. How does the world look to J.D.? Betts? Sela? Joanie? Lousia? Valerie? How does their world look to you? Betts is a woman with very discriminating, high-end tastes. Why would a woman like her get involved with a guy like Vinnie? Would it have happened if she wasn't in a state of near crisis? Betts's boss tells her that Integrity is the stuff that makes and breaks lives. What do you think about this statement? What does integrity mean to you? Have any of the characters in the story behaved with integrity? Can integrity be regained once it's lost? By keeping the secret of his birth from her son  and nearly everyone else  isn't Betts acting as manipulatively as Louisa? "Love can work miracles." Do you agree? Are there instances in the book that support this? J.D. 's maternal grandfather always told him: The pursuit of happiness is for the poor people. Do you agree with this? How is it true? How is it false? The novel is told from two viewpoints. What insights does this format offer into each character? How do the stories overlap and how do they differ? What role do the ideas of preservations and conservation play in the story?